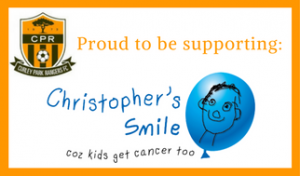 This year, we are pleased to be supporting local charity, Christopher’s Smile. Christopher’s Smile was set up in October 2008 after the founder’s son Christopher was lost to an aggressive medulloblastoma brain tumour. New treatments are urgently needed for the 20% of children who do not survive this type of disease along with those children who survive but face a lifetime of post treatment issues. The charity has raised over 1 million pounds for research projects that will benefit the children across the childhood cancer community. The charity pays no wages and making use of volunteers, they control their costs. When expenditure is unavoidable it is covered by either specific grants or paid for by the Trustees. Every penny of a donation is used for the cause for which it was given. Look out for representatives of Christopher’s Smile as you arrive!